Paying Ready Attention: I like islands. More than most other places I like islands, which I don’t suppose is an emotion to set me apart from the crowd. Neither is it a badge of pride, it’s just a statement of fact. Just one of those dichotomies that split us from some and join us to others. Beer or wine? The fish or the chips? Boots or shoes? Offshore or onshore? Many of life’s either/or splits seem to come from habit, tradition or inoculation. My fondness for islands seems to grow with the same inevitable path as my girth in middle age. But I need to define the terms of my affection before we move on. I am not talking about the huge, continental sized islands where, despite the best intentions of the ocean, you can still feel land locked. Nor do I mean the nation sized ones whose coastlines expand off into a distance suitable only for charity walking ex-sportsmen still desperate to live in the affections of the public. And while I may adore these places for a raft of reasons they lack the intimacy of place that comes with the name “island”. They are islands in name only. The islands of my mind’s eye are small and knowable, a place where the scale of the land does not turn casual exploration into an expedition. This may sound small and domestic, a vision of home-made bread and jam, rather than one of exotic adventure, but I love the feel of being in a place, rather than just being on a place. Ideally my island should connect to the mainland only by ferry – and the ferry should sell no tickets but return tickets. The return only policy is a statement of confidence by the ferryman that anybody on the island who wants to leave the island must have been brought there on his (or her) own vessel. You need a ticket to get on, but you don’t need one to leave. I don’t think an island can be joined to the mainland by a bridge – and once it is, it ceases to be a real island. Today, is anybody likely to write a song that contains the lines “Over the bridge to Skye”? I think not. We pack the car and pull away from the house. We have done this a little too often in the last two weeks. Too much change, too many disrupted plans. I try to remember how trivial all this is compared to the real impact of the fires. We head to and through Hobart, from dry rural to the heated city and back into the long grass. Tyre noise, road wind, the chatter of un-slept children – sometimes relaxed, sometimes not. The unspoken knowledge that we are a little late concentrates the mind and builds frustration with slow moving traffic. The contradiction of clock-watching on holiday, the tyranny of the timetable. I barely have time to turn off the engine before we are asked to move towards the open doors of the ferry. We have to pay in cash – none of this modernity of electronic money – the ferryman wants money he can fold. Money you can put in your pocket. The kind of money we had in the past. It’s a smooth ride out to Bruny Island. An island off an island. To be in Tasmania is to be in a world of islands. The mainland of Tasmania, Australia’s island state, sits at 26th in the league of world islands, just below Sri Lanka on goal difference, but with a game in hand. Its coast is sparkled with a necklace of 334 islands. Some obscure specks inhabited by little more than sea birds and the ghost voice of the wind. Some larger, with farms and a few shops. But none have become the kind of tourist meccas that flatten the land and dull the spirit. Bruny Island falls into the “some larger” category with a land area equal to that of Singapore – which rather contradicts my “smaller then nation state” criteria. But, and this is a really important but, it has a population of about 500 souls. That’s one medium sized hotel’s worth. Or to put it another way – its about 1/14 of the number of people in 1 square kilometre of Singapore. There are parts of Bruny Island so lacking in people that they don’t have a postcode. These statistics alone make it sound a place of deep, almost genetic attractiveness. And for once the statistics do not lie. The ferry pulls from Kettering on the mainland and lands at a place with no name on North Bruny. The island runs away to the south, and takes the form of a very, very battered hourglass. South Bruny, the bottom of the hourglass, is connected to its northern twin by a narrow strip of sand that seems to holds little more than a single-track road and a belt of sand dunes. From a strategically placed hill you can look along the length of this narrowing towards the south. The land is impossibly thin, as if a heavy sneeze, let alone a storm howling from the icy southern ocean, would tear one island from another. But it seems this neck, this isthmus, is made of sterner stuff than the fluff of sand and the dust of the road. Herons walk in the water by the side of the road, gulls with sun flicker wings cast around for food in the shallows and at night the air is filled with a cascade of strange calls. But in the daylight hours I follow the dust from the car in front, not driving into an unknown, but certain that the road is still there and, thin as it may be, that it still reaches the southern island. Our house is just across the road from the sea, a long stone’s throw or a good cast. An inviting balcony wraps around the cardinal points, with old and comfortable looking chairs facing placed to catch the sun. The pale, slightly careworn wood gives it a warm feeling – the overgrown garden merges into the bush, rocks gathered in lines and curves, the ghosts of old flower beds, look like hut circles from a different time and place. The whole house feels like it belongs here, as if it had come from the ground rather than been placed upon it. This feeling of exaggerated homeliness sweeps over you again as you open the door. Door handle rattle, old hinge squeak. Despite the transient nature of our visit the house feels like home – there are books on the shelves, toys in the cupboards and the cutlery draw speaks of slow accumulation rather then one stop shopping. Although clean there are marks on the tables and floors that speak of domestic accidents, spilt wine and laughter. It would have been no surprise to find the real owners sat in a sunny spot, with a mug of tea and a book. Many holiday houses feel as if the heart of the building has slipped away in the night, leaving an empty shell in its place. The sloughed off spider skin, which looks like a whole, living spider, but is just a ghost shell. It never becomes cool enough at night to need to light the fire, but I wish we had anyway. It would have been nice to smell wood smoke without the worry of bush fire, to hear the logs settle in the firebox as night sounds wrap the house. The short walk to the sea is disturbed by an echidna, and the echidna is disturbed by a dog. It bristles at the intrusion and sinks low to the ground, presenting nothing but sharp spines to the sniffing, inquisitive nose. It becomes a war of patient endurance, in which the echidna has the advantage of time and the dog of innovation. Soon the dog is distracted by some other scent and dashes off to investigate. The echidna ignores its change of status and keeps waiting for the coast to be clear of barkings and wet nose, but spiked, snuffles. I leave it to its stillness and walk the last few yards to the beach. A small stream, still with a gentle flow of water, runs down to the sea. It holds black ducks and a white faced heron. Overhead swallows and martins dash, rapid and fluid through the insect sky, a thin, but nutritious, soup. In the distance kelp gulls laugh, a counterfeit of the herring gull so beloved of sound effect men and film producers. It takes me a while to notice the sound. It remains such a classic part of my internal seaside soundscape that even an absence of almost 20 years does not erase it. Eventually it breaks through as an unusual sound and I remember where I am and what I should hear. 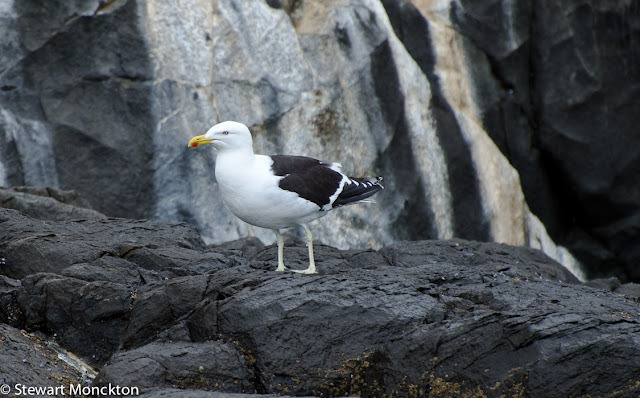 The kelp gulls stand on a small rocky ledge, grey backed, fine beaked, perfect Larus. Memory stirs. Cold winds blow, blown in from the North Sea, chill and sharp. Warmer winds blow from the Atlantic, soft and heavy with rain. All bring gulls. Following the plough. Driven by the storm. Seagulls as a kid, just gulls now. A kind of constant, a kind of companion. The shore is covered in rounded stones that clink clack as you walk over them, moving in the same way that rounded them in the first place. It’s tempting to place them in stacks and piles, beach cairns in homage to Mr Goldsworthy. A short shot of order in a world overturned by the force of the waves and the day-by-day march of the tides. One day never the same as the next. We wait in line for the boat, wondering if we are wearing enough clothes. Wondering if thin layers will work, when what we really want is a thick jumper and a woollen hat. The brightly coloured boats pull away from Adventure Bay and motor towards the southern end of South Bruny – towards the bottom of the egg timer. The guide tries a scattergun approach to humour and comment, mostly missing the mark, but noticing (slowly) when he hits the target. It’s clear he has much to say, but seems embarrassed to do so, hiding his knowledge in jokes and silly over-simplifications. Even H notices. Dressed in full-length red jackets everybody looks like a character from a kid’s show, draped in lengths of cloth and pretending to be sea-farers. 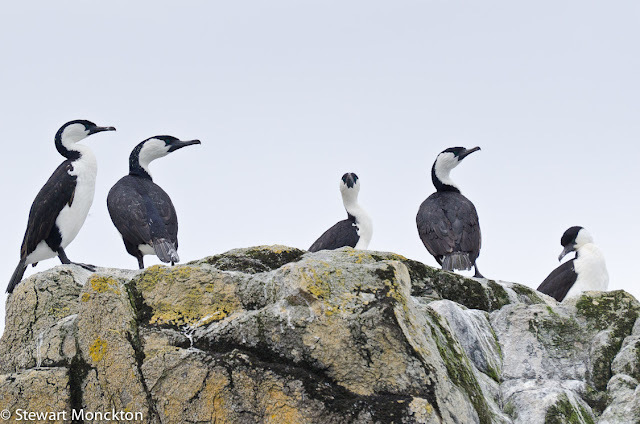 The boats are agile and fast, slipping close to the coast where the rounded rocks gather waves, cormorants, but no rascals. In perfect evening dinner jacket code, Black Faced Cormorants stand and preen their oily feathers, dry their wings in the coast edge breeze and wait for the turning of the tide. Below their rock ledge roosts the cliffs are stained white from generations of use, the rocks themselves taking on the smell of old fish and partial digestion. The boat stops and we watch, gazing up the steep faces. Sea level sits at one age and the rock grows younger as you look upwards, following time’s arrow towards the sky. Some rocks are twisted and torn, bent from the table flat origin. Fractures, small points of weakness, are made larger by the pounding of the waves, bubbles burst with unseen explosive fury and one grain at a time, caves are carved, solid soil heartlands become open sea swept headlands. 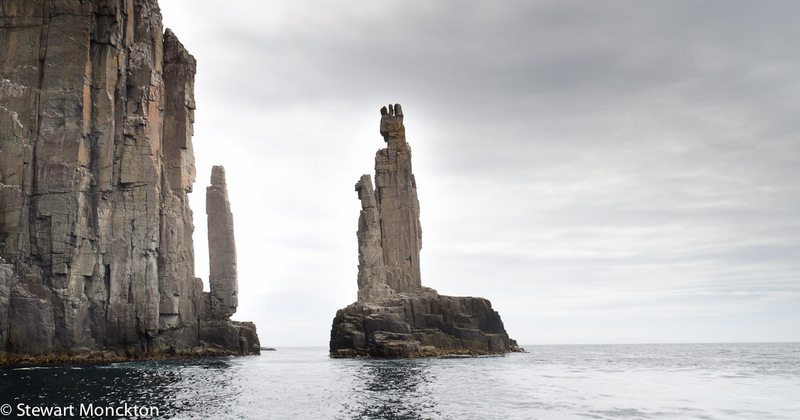 The cliffs of South Bruny are some of the tallest in the southern Hemisphere, old beyond real understanding, tall beyond the reach of most. Vertical lines pull the eye upwards and push the mind back towards thought of the old climbing boots and gear sitting in a blue cardboard box at home. Where they will stay. Chimneys and cracks evolve in areas of weakness, the removal of the weakest and the survival of the hardest. A huge rock pillar – known as the Monument – stands on a solid platform, cut off from the shore by a narrow, foamy channel. The boat passes through the gap, some form of needle thread, at high speed. Passengers squeal, the boat captain laughs, the stone face atop the pillar is unmoved. If I did not know better I would have thought the stone had been carved – a woman and child? A man and boy? The old and the young? I can’t help but think of the Argonath, the huge ancestor statues that sit on either side of River Anduin in Lord of the Rings. I’m sure my passage beneath through the needle’s eye is nowhere near as significant. But it is as spectacular. This is rock as sculpture, art and nature converging at a singularity of weathered coincidence and human interpretation. As is the way with even the hardest rocks, flat platforms of stone jut out from the base of the cliff. 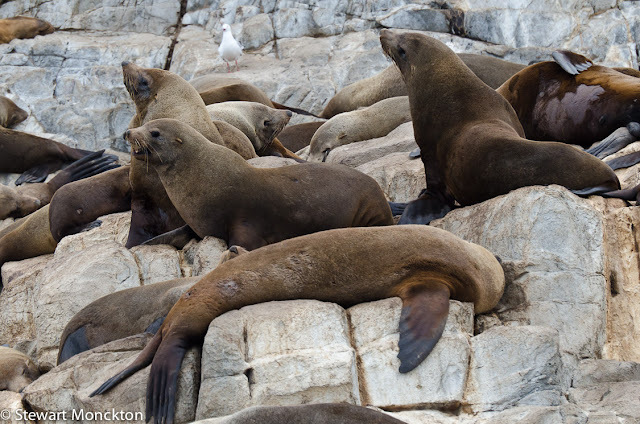 They form a wave washed home for Australasian Fur seals – seals with ears and semi-stiff front flippers. They watch us, with heads cocked in partial interest, and slip into the water to swim beside the boat. Fur, slicked by the water, shines like polished leather. They swim because they can, and outrun the boat at will. The waves that wash the rocks take away the olfactory assault normally associated with such places. With sea spray damp clothes I’m rather glad they do. The boat noses its way into caves and sits close to the rocks, the engine purrs – a cat by the fire, pleased with its power and grace. Unaware of flaw or fault. Land filtered water in spangled, diamond bright drops, falls from above. I try to catch them in my hand to see if they are salt or fresh; sea water or air water. 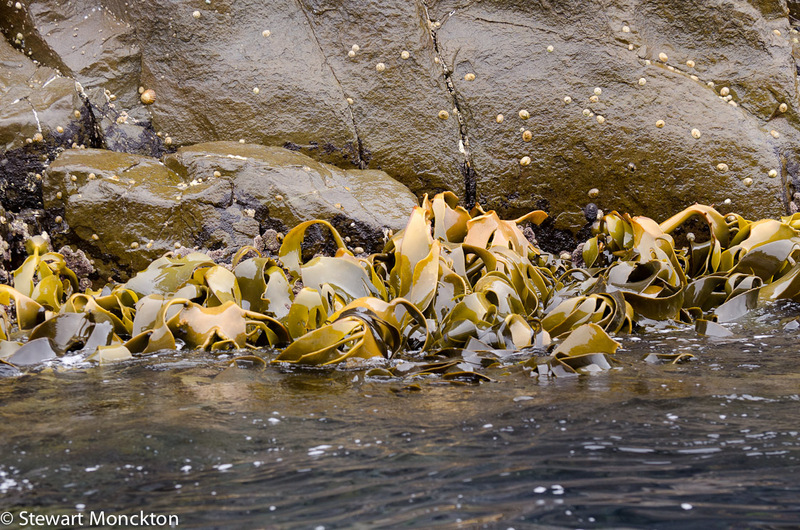 Seaweeds, kelps, holding fast to the rocks at the very top of the low tide marks, wrap the rocks. In some of the cracks between the rocks you can glimpse crabs. The water washes clear and pure. Life abounds. Waves rush into a deep cut in the rocks and push the air into a smaller space with the whole weight of the ocean at its back. When the waves pull back the air rushes back into the open space and the deep cut seems to breathe out vapours of life. The rock seems to live. In and out with the waves. Jets of water from the lungs of the Earth. The kids on the front of the boat, my kids, get wet. They enjoy it at the time, but later complain of cold. 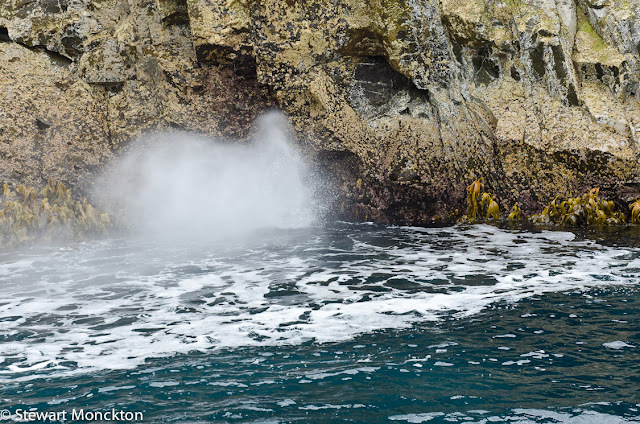 The sound of the boat’s engines changes as we head away from the cliffs and the breaking waves. On the horizon I can see smoke – a filtered grey cloud that lifts from the sea in waves. Some clouds go one way; some go the other, in contradiction of their true behaviour. The closer we get the more granular the clouds become, as if you could I could see the molecules in a cloud, the particles themselves revealed. The clouds are birds – uncountable numbers of short tailed shearwaters, mutton birds, gathered in floating and flying groups all over the sea. Their motion seems random, some fly away from us, some fly towards us, some fain casual indifference and sit, becalmed on the waves. Focus becomes almost impossible; it’s like being inside a blizzard looking for a single point of reference. From above our boat may have looked like a still point, a centre, but from inside clarity is not possible. Shy albatross fly on board stiff wings through the wing thrashes of the shearwaters. Slate blue grey birds are fairy prions. 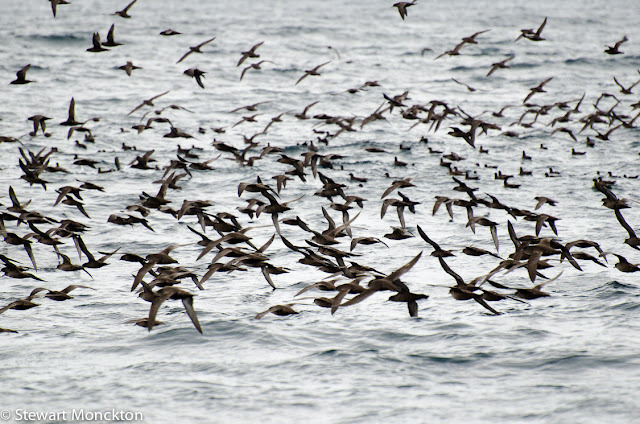 But the thousands and thousands (who knows) of shearwaters clog the horizon and fill the mind. 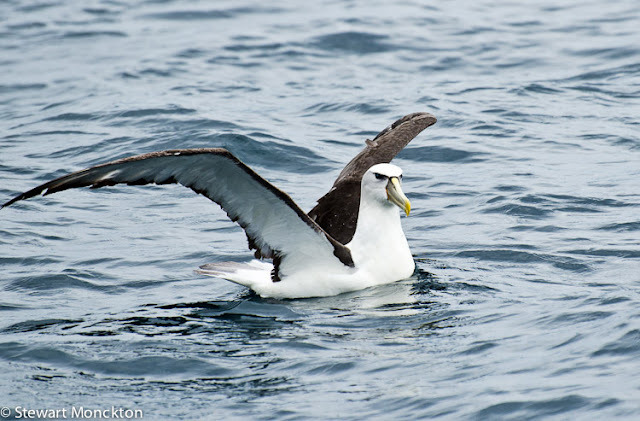 At last we reach a still point where an albatross sits on the water, wings cocked above the water; bent, long and thin. Impossibly light, but capable of such speed. It turns its back on us and runs over the water and splash jumps into the air. We turn our back on the birds and head back to our island from an island. Back to the small mainland that is Bruny Island. I can see why you love these islands so much. Stuart, another of your wonderful 'place' essays. 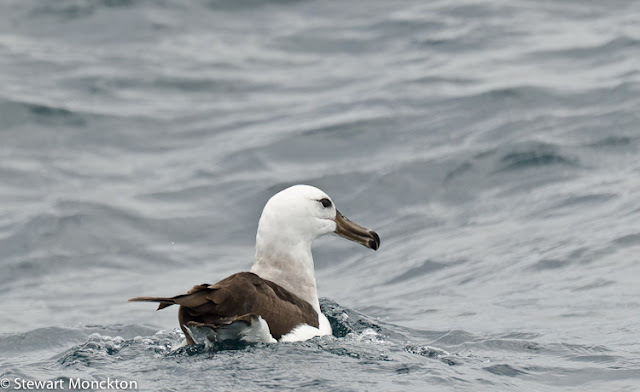 As ever, I was enthralled and green with envy - the first and last time I saw an albatross was on our initial migration to Australia in '49. You bring home the picture of your experience like my daughter brought out the picture of seven years after Katrina in New Orleans, that she wrote in mud on the wall of her exhibition of the same name. We had extreme winds before the cool change but just an hour or so of thin Scotch mists worse luck. The standing stone queen, complete with crown, is definitely Lord of the Ringish. Yes you can go fantasy - or you can go "Old Man Of Hoy" - this is as evocative as an Orkney trip. Am totally with you on the island concept, Stewart and couldn't agree more with the Isle of Skye analogy! Another lush piece of placement with words. Thank you. I realy enjoyed seeing those beautiful images and pictures Stewart!And all those lovely animals!You are a lucky man! !Thank you for sharing! !Have a lovely day!! Beautifully written, you found words to describe that which is almost beyond description. This looks like an easy place to fall in love with. Beautiful photos Stewart! Just takes my breath away......so fabulous; incredible. I love having friends all over the world online because I get to see things, I would probably never get to see. Thank you for sharing. This looks like our Anacapa Islands in the Channel Islands. What a lovely place to visit! Great post! HI Stewart...My first time her, and I am just in awe of your writings, and stunning photos!! I went back three posts...your accounts, and description are in such a way that I want to keep reading,but haven't the time to : (..I am going to come here from time to time!! Stewart people hear are complaining about a 12 inch snow fall to start the fist day of spring!! I will take snow over fire any day !! An amazing place! And an interesting story...love your photos! Ref. to my photo...No, the birds are jackdaws. Thank you for your kind comment. I do like islands, too. Though ours in the U.S. tend to be way to sought after by tourists. We south across the country to Texas this past week, and I had really wanted to visit Padre Island, but due to Spring Break & college students partying, it is said to be "standing room only" there. So we stayed to the Hill Country inland. While I like islands, I love solitude & quiet more. Maybe everyone flocks to the island to get away.. but really they've spoiled it by their numbers. Anyway, your islands are beautiful, and your writing & photos are very eloquent, too. We do enjoy somewhat of an island life when we travel 500 miles further north of us where we have a cabin in remote northern Ontario, CA. There, too, we have experienced fire danger, and have felt pretty safe on our island. I can imagine why you would love this island. What an amazing experience...like stepping back in time to a different era...but it is hopeful t me to know that these places still exist. I love your shots. Such beautiful birds here. From one island to the other.....so true! I think I love those trips the most. Very exciting finds in the ocean, but sometimes the stomache needs to be strong as the waters can be quite choppy. This is my absolutely favorite kind of writing. I loved this trip with you! That rock in your first image would undoubtedly be called, "Indian Chief Rock," if it was over here.